I attended a couple of Computer Assisted Research Group (CARG) presentations. Patrick Durusau talked about semantic integration. Basically we want to pack a lot of metadata into the background of documents (biblical or any scholarly work) but make it as easy as possible. The Open Document Format (ODF) will be helpful here, and apparently this will become the default for Microsoft Wordpad in the future. 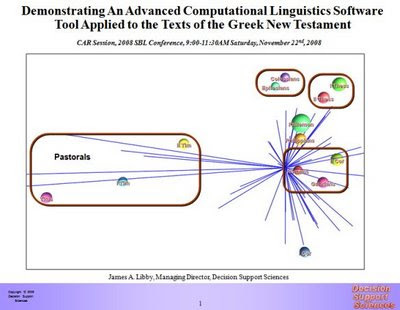 James Libby of Decision Support Sciences had a presentaton entitled "Demonstrating An Advanced Computational Linguistics Software Tool Applied to the the Texts of the Greek New Testament." The company employs a research tool called PositionSolve to analyze all sorts of textual data. Libby took this tool and applied it to the Greek New Testament. Let's just say there's a lot of math involved, but basically it's analyzing all sorts of grammatical information and then determining relationship between groups of texts, e.g., books of the NT. These results are used to generate three dimensional models that indicate degrees of similarity. One such result is shown below. The further out, the more distinctive a text is. The groupings indicate similarities. There are any number of other ways that the data can be run through, but this particular display clearly indicates how genre can be distinguished by such an analysis. I've blogged before about the virtualization of Sinaiticus project. A number of the people directly involved with the project (including Brother Justin from St. Catherines) had a special presentation discussing their work and some of the findings as a result of the transcription work they have been doing. Interesting stuff as they identify the characteristics of the scribes/correctors... They hope to have the work fully online by July of 2009. I also got to hear Steve Runge's presentation on "Left-Dislocations and their Contribution to Information Structure." He is able to define more concisely the function of information that is placed at the beginning of a sentence before referenced again later in the sentence. I'm looking forward to his Discourse Grammar that will be forthcoming. In the meantime, check out the work he is doing on his NTDiscourse site. 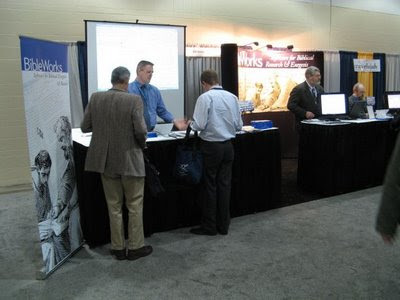 I attended a few other non-technological sessions (the one discussing Dale Martin's book on Pedagogy of the Bible was particularly interesting), but a big part of SBL involves catching up with people, and also browsing the exhibition hall. I spent some time with Glenn, Mark, and Jim from BibleWorks looking at the new version 8. I think it's going to be a very nice upgrade. The new analysis tabs are really nice, especially the Browse, X-Refs,and Context ones. The ERMIE (External Resources Manager) should prove to be very popular and helpful. 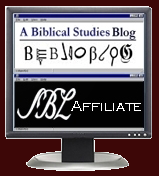 The long list of new resources (e.g., Greek Pseudepigrapha morphologically tagged with new translation by Craig Evans, Talmud and Mishnah, Greek and Hebrew grammars by Wallace, Waltke/O'Connor, and Jouon/Muraoka, and much more) will be greatly appreciated. (Do note that part of the reason that so many texts can be added and the price held steady is because three works are omitted in this version that were in 7: the Lust-Eynikel-Hauspie Greek-English Lexicon of the LXX, the Newman Greek-English Concise Dictionary of the NT, and Metztger's Textual Commentary on the Greek NT. Since Friberg and Gingrich lexicons are already available in BW, the loss of Newman's is no big deal. There is nothing quite like the Lust lexicon, so if you are doing LXX work, you may want to add this to your list as a module to purchase for $25. Metzger's Commentary is very nice, but you can get quite a bit of the information from the NET Bible notes, from the user-created text-critical notes by Willker, and from external links to LaParola http://www.laparola.net/greco/index.php or Zhubert http://www.zhubert.com/bible?source . Also note that if you bought BW7, you can get those modules unlocked for free.) I'll be anxious to do more with the program myself when it becomes available later in December. Thanks to the receptions sponsored by the Wabash Center and Fortress Press to end the day!